Local USA 829 currently admits members into the following Categories or Classifications of Membership, each of which has certain job descriptions and responsibilities including but not limited to those listed below. An individual may become a member in multiple Categories, except for Industrial Members who would move out of the Industrial Member Classification after passing whatever test necessary for being accepted into the Scenic Artist Category (you're either a Scenic Artist or an Industrial member; you can't be both). USA 829 Scenic artists are employed at scenic shops in New York, Chicago and St. Louis, at the Metropolitan and other opera companies, in network television, on commercials and on feature films and episodic television from Delaware to Maine. Scenic Artists work closely with Scenic Designers and Art Directors as well as other IATSE union crafts. The craft of scenic art involves being able to master and execute the following skills: Lay-out, surface decoration, sculpting, mold-making, casting and painting of scenery and properties for all media, plus the execution of models, miniatures, and some graphics. 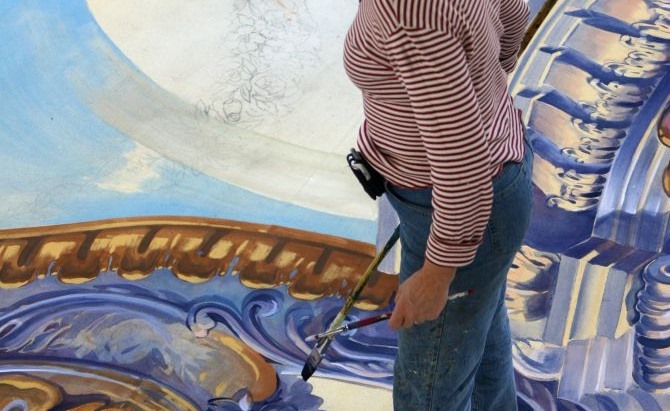 The ability to match color, create faux finishes and paint Trompe L’oeil are essential skills for a scenic artist. USA 829 scenic artists are expected to meet a very high standard in these areas. Scenic artist jobs are physically demanding and often, especially in motion pictures and commercials, members are asked to work long days that are ten hours or more and often start at 7 am or earlier. Besides painting sets a scenic artist is involved with the prep work prior to painting. This may involve spackling and sanding plaster/joint compound and troweling with heavy compounds to texture walls, often while working on a scaffold, ladder, crane or genie. A scenic must be able to carry five gallons of paint, joint compound and other materials. A scenic will often work standing for long periods of time, and of course they work overhead using rollers and other tools. Scenic art work is not as glamorous as some other jobs in the entertainment industry and a scenic is often covered in dust and paint. But it is the scenic artist that has the talent and skills to take a designers rendering and recreate it in giant proportions, to turn a piece of plywood into beautiful marble, to make you believe a flat object is three dimensional. They create the surface of the production in texture, color, and artistry. Members of the Scenic Design category work on projects in the areas of both Live Performance – theatre, opera, ballet, concerts, industrial shows, exhibits – and Recorded Media – film, television, web streaming, cable. That being the case, Scenic Design members perform a variety of jobs, depending on the type of project. In Live Performance, Scenic Designers read and analyze a script that might be available for a project, have discussions with the director and producer about concepts, production timeline and budget (including how much time has been budgeted for an Associate and/or Assistant Designers who are involved in all steps of the process) and then design the set(s) required for the production. The Scenic Designer does research as needed to create sketches, renderings and/or a model for presentation. They create drafting and working drawings, with details and specifications of colors, textures, finishes and furnishings that are necessary for the carpenters to build the sets, for the scenic artists to paint and finish the sets, and for the props master to dress the sets. The Scenic Designer and Associate/Assistants supervise the construction of all elements of the design by visiting the chosen Scenery Supplier and attend the load-in of the production in the theatre or other venue where the production will take place. The Scenic Designer also attends tech and dress rehearsals and preview performances and will design and supervise any changes or additions that may arise as the production heads towards the opening. A successful commercial production may find the Designer being asked to reconceive the design to tour. In Recorded Media, Scenic Design members may work as the Production Designer, the Art Director, the Assistant Art Director(s) or the Storyboard Artist. 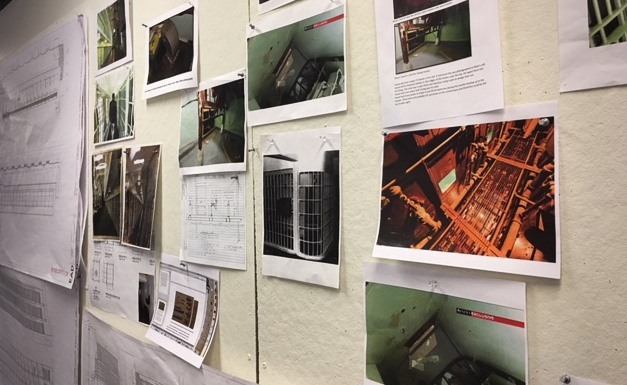 The Production Designer’s job is analogous to the Live Performance Scenic Designer’s: they are responsible for the “look” of the show by designing what the constructed sets will be and by selecting (with input from the producer, director and writer) any locations to be used and how these may need to be modified for shooting. The Production Designer provides input to and approves the work of the Set Decorator, the Art Director, the Graphics Designer, the Assistant Art Directors and the Scenic Charge Artist. As opposed to the timeline for a Live Performance production, where the goal is to get everything ready for the opening performance, Recorded Media productions have a schedule set by the producer which includes “Pre-Production” (work done before shooting begins), “Production” (work done concurrently with shooting) and “Post-Production” (wrap-up work after shooting has concluded). Where films have a generous production period of several months to a year or more, episodic television operates on a very compressed 7- to 10-day production schedule: there is a new script every 7 or 10 work days. USA 829 Costume Designers create the looks of actors and performers in theatre, dance, opera, film and television. 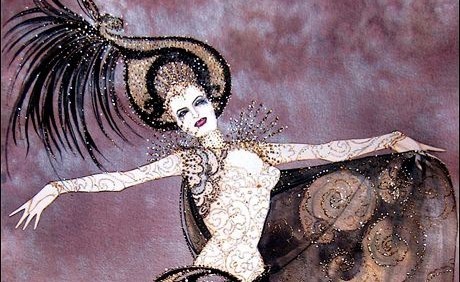 The Costume Designer is a visual storyteller, translating dramatic ideas into physical garments for stage and screen, in a process that begins with creative conceptualization and extends through to execution. The Costume Designer‘s work includes script analysis in order to determine both the physical needs of the project and an overarching visual concept; the production of all required costume sketches ; selection of all fabrics and trims for any built costumes; providing any specifications needed by the costume shop to make or alter costumes and costume accessories; selection of any purchased, promoted, or rented garments and accessories; the supervision of all necessary fittings ; attending of any necessary rehearsals and production meetings; hair and make-up consultation; and budget management. The ability to do these things requires a strong foundation in all of the arts, a firm understanding of historic and contemporary period and style, garment construction, fabric techniques such as painting and dying as well as an ability to work collaboratively with directors, actor/performers, fellow designers, writers, and producers. USA 829 Lighting Designers create the design and direction of lighting for theatre, opera and dance and other live performance venues. 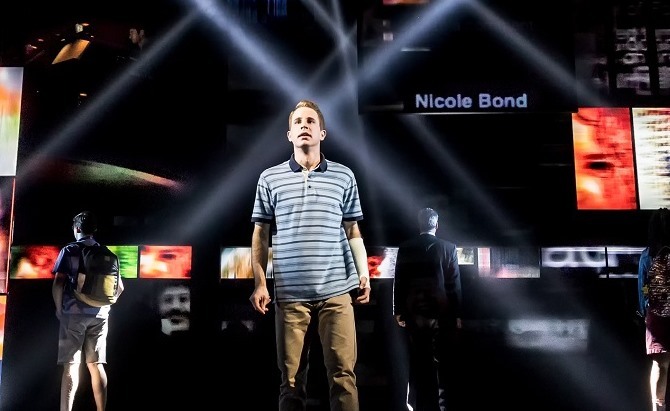 Lighting design for the stage is cinematography for live performance. It manipulates the audience in how to see the event and controls where we look. Lighting is the atmosphere of the event. Jean Rosenthal, a pioneer in stage lighting, wrote: "Design in the theatre is the creation of atmosphere. It is either representational atmosphere, such as in the naturalistic theatre of accurately placed suns and moons, or it the abstract arrangement of an environment that creates an atmosphere right for the intention of the play." Producing a theatre performance is a collaborative event that begins with the work of the playwright, composer or choreographer. The primary interpreter of the work is the director and/or choreographer. 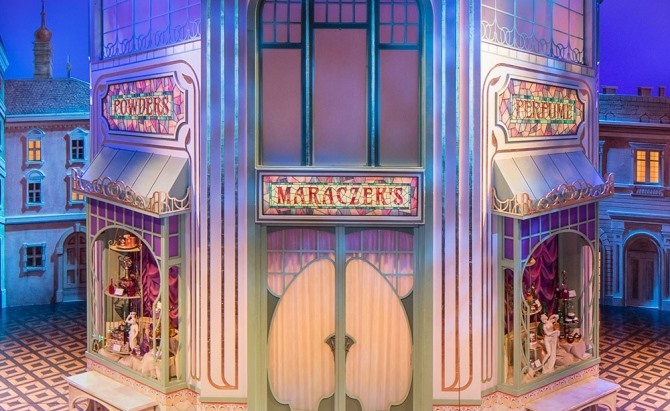 The scenic designer establishes the look and the physical plan of the production. The scenic designer is the lighting designer's closest collaborator. The lighting designer understands their design and collaborates to carry out the intentions of the play. The lighting designer begins to delve into the specifics of creating the big visual idea, which now becomes a process of placing individual lighting instruments within the confines of the scenery to establish the proper angle and position of equipment to achieve the lighting design. This is the most important part of the design process, for this is when all of the major design decisions are made. This laborious process leads to the paperwork that the designer must produce for the stage crew that will install the lighting equipment that the designer specifies to accomplish their lighting design. After all of the lighting equipment is focused to the position the lighting designer figured for each fixture, the real art of lighting begins. This is the cueing session, when the lighting designer chooses the appropriate equipment set to various intensities to accomplish the "looks" that the scenic designer, director and lighting designer discussed before this entire process began. This can be exhilarating for the lighting designer, provided everyone involved remembers what was discussed and sticks to the plan. Or, it can be frustrating when everyone has a different idea upon seeing the set under a condition of stage lightning. At this point, the diplomatic lighting designer hopefully get everyone back on the same page. 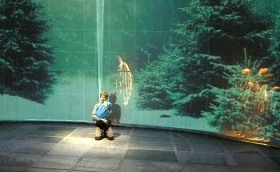 Each "look" will be connected by a series of light cues, which adjust the light from one idea to another. This is the "cinematography for the theatre", and is the most rewarding portion of the work. The sound designer creates the aural landscape of the production. To do this Sound Designers employ a vast array of practical and creative tools to facilitate their work. Composed soundscapes, original music, combined with vocal, environmental, and instrumental enhancement, can be conveyed by the simplest of means or by the most complex contemporary audio systems. The modern sound designer synthesizes aural creativity and musicality with dramatic sensibility to create and implement evocative sonic environments that support collaborative live storytelling. The artistry of the theatrical sound designer has become a crucial part of theatrical productions. USA 829 Projection Designers create ephemeral imagery for live performance delivered via a wide variety of technologies including projectors, LED surfaces, monitors, and other digital and analog methods. Projection design for the stage is the design discipline most recently added to USA 829, and as a field in the theater it is still growing and changing substantially. It exists at the intersection between the cinematic language that emerged in the 20th century, and the much older traditions of live performance. First and foremost, projection design is about the use of image as a means of enlightening or complimenting the text of a production. At the most rudimentary, this may be a matter of communicating time or place, however in the majority of applications the role of projection goes well beyond this. Projection may be used to contextualize action, create mood, reflect a character’s psychological state, or represent characters or ideas in their entirety. In addition to the crafting of a moment to moment understanding of how image will relate to the text and how they will integrate with the other aspects of the production, the projection designer is also responsible for overseeing the design of the system, specifying equipment, sequencing the material in co-ordination with the other design departments and the production at large, and supervising the production of original content. USA 829 Computer Artists work within the Art Department of television shows, feature films and commercials. Computer Artists most often work directly for the Production Designer and Art Director, and must also coordinate with the Set Decoration, Props and Playback departments, among others. Computer Artists are responsible for breaking down (listing and detailing) the scripted graphic elements of a production, reading “between the lines” of a script for additional graphic needs, collaborating with other departments to make design choices, and managing the creation and fabrication of those elements to be used on set. Typical projects include; logo design, signage, packaging, newspapers and books, photo editing, motion graphics, screen graphics and prop concept design, among others. Computer Artists are generally required to work a 10-hour day in an Art Department office environment. 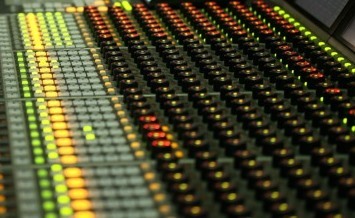 Productions typically hire only one Computer Artist (two or more might be hired for larger productions). With myriad duties as listed above, shooting schedule deadlines, and the need to triage projects in what can be a changing priority order, CA's must be self-starters, good at managing their own time and work load, and able to work under fast-paced sometimes stressful situations. The field of computer art is constantly evolving, and Computer Artists continually grow their skills accordingly. At this time, it is expected that a Computer Artist be highly proficient in Adobe Illustrator and Photoshop, and have skills in other programs such as InDesign, Flash, After Effects, Keynote, etc. Computer Artists are also great creative problem solvers, highly organized and have good communication skills. Art Department Coordinators work in the art department of commercials, motion pictures, television programs, and scripted streaming content. Reporting to the Production Designer and Art director, Art Department Coordinators are responsible for the efficient day to day operations of the art department office. The Art Department Coordinator (ADC) interacts with all other departments within the production company including but not limited to: set decoration, construction, accounting, production, props and locations. Within the art department ADCs work closely with Set Designers, Computer Artists, Illustrators, Set Decorators, Prop Masters and others. ADCs are often one of the first staff members to be hired and will also wrap the department at the end of production. The tasks of the ADC are many and varied as production progresses; selecting production assistants, setting up the art department office space, ordering furniture, office machines, and supplies that will be essential to the art department staff, and opening and closing accounts with vendors as requested. 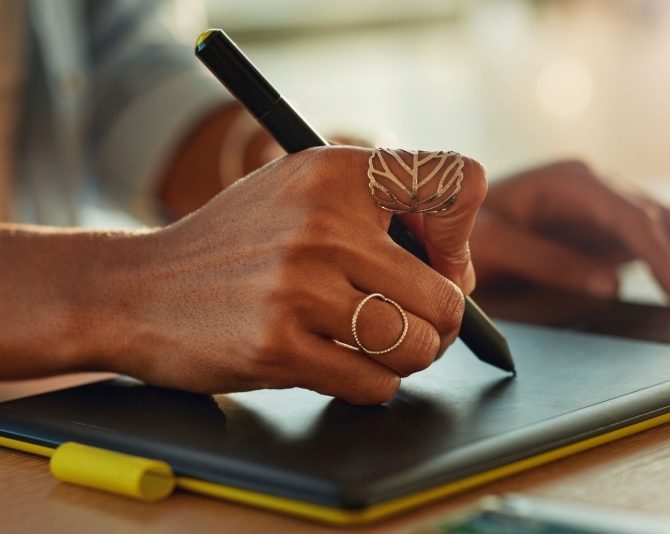 The ADC will monitor or “track budgets” for the art office, construction and set decoration, keeping meticulous files regarding all expenditures by the various departments. The ADC also maintains logs of all construction drawings, and furniture plans as they are distributed at the direction of the art director. The ADC will also facilitate the clearance process as required by the producers. ADCs are proficient in the Microsoft Office suite as well as Adobe Acrobat Reader, and web-based applications. Some knowledge of networking is also a preferred computer skill. As the digital side of film production expands, computer proficiency becomes more vital. Art Department Coordinators are an essential part of the art department on every project. They are the hub of the art department; providing administrative and creative assistance that allows Production Designers, Art Directors, and Set Decorators to bring their designs to life. A USA 829 Costume Department Coordinator (CDC) works within the costume department of television shows and feature films. The budget of a costume department is notoriously difficult to track. Costume Department Coordinators are responsible for maintaining a balanced and organized budget while at the same time managing the activities of a very busy department. While the main job of the CDC is acting as a liaison between the costume and accounting departments, they are also tasked with many other important responsibilities; using the tools and labor at their disposal to meet the many and various needs of the members of a costume and wardrobe department. Their days are filled with everything from sourcing and ordering supplies to managing the flow of incoming and outgoing store and rental returns. CDCs start their work in the early stages of prep by setting up vendor and rental house accounts, selecting production assistants and getting the department prepared for what lies ahead. During the shoot they use an accounting program to enter purchase and return receipts, invoices and projected costs, all in an effort to remain on budget. They must have strong multitasking skills as they are simultaneously required to keep the department organized and running smoothly. During wrap they work to finalize the budget and locate the assets as required by their production company. While every production makes different demands on the Costume Department Coordinator, there are some essential skills every successful CDC will have; the ability to stay calm under pressure, to quickly triage incoming tasks, and a fondness for numbers and organization.